SUMMARY: David Wasdell, head of the Apollo-Gaia Project, returns to Radio Ecoshock with devastating revelations about how climate science has been manipulated or ignored by the IPCC, and by the leaders meeting in Paris. We are committed to far more than 2 degrees of warming. A vastly changed world awaits. Radio Ecoshock 151118. Are you ready for the harsh reality of our future in a hotter world? Can any of us really handle the truth? If you feel strong enough, this may be the most devastating look into where we really stand. Perhaps you remember UK writer Mark Lynas stunning us with the awful changes on Earth if we warm by 5 degrees Centigrade. We may not survive six. Many hope the climate talks in Paris can reach an agreement that will save a livable climate, keeping global warming below 2 degrees C. But what if the national leaders are just players on a stage of illusion? What if someone told you our current levels of greenhouse gases already commit us to more than 6 degrees of global warming, and over 12 meters, over 36 feet higher sea levels? And that may not be the worst of it. Or listen right now on Soundcloud! Last week, a couple of dozen people stepped up to help Radio Ecoshock keep going. There is no secret foundation paying for this program. Nobody pays me for the 40 hours I put in each week to get this critical information out to you, and to the world. I know some previous green programs, excellent programs with seasoned hosts, had to go off the air due to lack of funding. Usually there was at least one program director on staff, who helped line up guests, and perhaps another doing all the research needed. When people couldn’t get paid, those shows closed up. Knowing there would never be a commercial market for deep eco-truth, I set up Radio Ecoshock ten years ago on the barest budget possible. There is no staff. I do it all. We don’t have the overhead of a non-profit society (with high administration costs). There is no fund-raising department. This is it, and you are the co-owners of the program, when you sign up for the $10 a month membership, or make a donation of any amount. Frankly, a few weeks ago, I felt like giving up. Not because of money, which is always low, but because for the past 10 years our expert guest explained why urgent action is needed. Instead, emissions just went up and up, and our natural environment continues to degrade. But we can’t give up, can we? This is the only world for us, for our descendants, for all the marvellous creatures living on Earth. I’m re-committing to another year of Radio Ecoshock. I hope you’ll join me, to help pay for this project. Check out your options on this page. Thank you. IS THIS THE MOST IMPORTANT RADIO ECOSHOCK SHOW OF 2015? This is a very intense program, with lots of science, clearly expressed for all of us. In order to help everyone, here is a “.pdf” rough transcript of this program, including all the science David lays out. Please feel free to dive in for yourself, add you comments to this blog, and forward both the program and the .pdf transcript as widely as possible. Just copy and paste this address in your browser. Or download it to your computer. It’s simple. Go to this page at apollo-gaia.org. If you click on the headshot of David Wasdell, you will get a video, 1 hour 16 minutes long, as David explains where we are right now in the climate, and where we are going. It has graphs that make it seem simple, even though he deals with cutting-edge science. 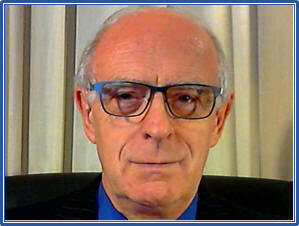 If this recorded video conference seems to stop and start, it’s likely you are trying in a period of heavy internet use. Try again at a time when fewer people are on the net. Of course, one of the benefits of my full-length radio interview of David, is that anyone in the world can download or listen to it. People in countries with low-bandwidth, or poor access, should choose the “Lo-Fi” version, which is ten percent the size of the CD Quality broadcast. That’s also a good choice if you want to listen online. Or use the soundcloud version here. Soundcloud usually plays well with no interruptions. If you prefer the print approach, click on the title slide to the right of David’s picture. That leads you to the .pdf text to accompany the video, with a full explanation. Wasdell has gone to great lengths to make this deep science available to all of us. It’s a critical mission. We cannot allow ourselves, or our leaders, to continue using “convenient” science, instead of facing the harsh realities. All I can tell you is that I’ve heard from over 100 previous scientists interviewed on Radio Ecoshock – the evidence that David Wasdell adds up for us in this talk. It’s sobering, depressing, and maybe yes, liberating. We can only go forward when we know where we are right now. Please help this message get out widely. Share David’s video link, this program, your own thoughts and activism. Giving up is not an option. I’m your dedicated friend, Alex Smith. My thanks to all those who reached out to support Radio Ecoshock this week, who Tweet and Facebook further than I can. Please don’t leave support for this program to “others”. Thank you for being brave enough to listen, and let’s meet again next week. Thanks so much for this show and all the pioneering work you bring to your audience, Alex! There is a reason why Ecoshock should rely on actual scientists when you interview people on scientific issues like climate sensitivity. I was giving talks in 2008 on how the IPCC is underplaying global warming, but Wasdell's analysis is way off base. James Hansen — not someone to play down the risks of climate change — has looked at the paleoclimate data on climate sensitivity (which, by definition, includes all known and unknown feedback effects) and comes up with ~3ºC, which is far less than Wasdell's figure. The bottom line is there are non-scientists that claim there is no such thing as global warming and there are non-scientists that say they understand climate sensitivity better than trained climate scientists. They are both wrong. Let's promote the views of those that know what they are talking about. +3ºC sensitivity is bad enough! I've checked out Hansen's paper regarding sensitivity that Mr Miller refers to. Here is the text from the intro:'Our best estimate for the fast-feedback climate sensitivity from Holocene initial conditions is 3 ± 0.5°C for 4 W/m2 CO2 forcing (68% probability)'- this statement excludes slow feedbacks. In fact Hansen states in the paper ‘It is difficult to assess the speed at which slow feedbacks will become important in the future, because of the absence in paleoclimate history of any positive (warming) forcing rivalling the speed at which the human-caused forcing is growing’ Gavin Schmidt argues that the fast feedbacks are the only relevant ones over the short term, essentially ignoring the slower positive feedbacks (for example, the thawing of the land and sub-sea permafrost in the Arctic). Clearly, the current models are considerably underestimating the changes in the Arctic region, particularly the volumetric loss of the sea ice and signs that the methane and carbon dioxide emissions due to melting permafrost are gathering some momentum – tipping points – which could have considerable bearing on the sensitivity value this century. Wasdell is quite rightly drawing our attention to the a very dubious carbon budget metric which assumes that none of these slower positive feedbacks will come about within the near future – I very much agree with Wasdell that this is a foolish premise for the basis of our strategic response to climate change. Whether one agrees with Wasdell's Earth Sensitivity value or not (and by the way in that same paper referenced above, Hansen places great store in using the paleo-climate record to help derive the Earth Sensitivity value), the truth is that the current predictions are based on the lower bound value of Earth Sensitivity with the real figure being greater than 3, probably significantly greater than 3. And as Wasdell makes very clear, the Earth's ability to deal with Greenhouse gases was very different in the Holocene than in the current Anthropocene (viz: degraded carbon sinks etc). And taking Hansen’s point, there is nothing in the paleo climate record to match the pace at which we are adding carbon dioxide and its equivalents to the atmosphere. Just because a sensitivity of 3 is ‘bad enough’ should not mean that we use it. When do slow feedbacks speed up? When they are in the Arctic. The climate sensitivity of the Arctic methane clathrates is a perfect example. Emissions are speeding up. Natalie Shakova spent 10 years in the Arctic watching the methane dramatically increase with under 1°C rise. She says everything is anomalous. Gavin Schmidt sat in front of his computer for ten years working on "models" that ignore slow feedbacks. He says its nothing is happening. Everyone should read this (especially people who are focussed on climate change and/or peak oil)- Meadows is so clear and unassailable. "…hunger, poverty, oil depletion, climate change—are not in themselves problems; they are symptoms. The problem is continued material growth in a physically finite world." "Our society has moved into the rapids phase. Climate change is an example of this. There was a period where we had some possibility of influencing future climate by our decisions about the use of fossil fuels. I think that time has passed. Climate change is increasingly dominated by a set of feedback loops—like the methane cycle and the melting of Arctic ice sheets—which are beyond human control. They have come to be the drivers of the system. The dominant drivers of the system are not people sitting around trying to reach a consensus about which of several different possible outcomes they most prefer." 1. In the first minutes, you said something about Ecoshock seeking to provide "scientific proofs." You probably didn't mean that; whether or not you did, you should understand that "proof" in this context–empirical science generally and Earth system modeling particularly–is a *very* bad usage, and a "red flag" in some quarters. The term "proof" is only legitimately applied to deductive arguments: David Hume (and predecessors going back to at least Sextus Empiricus) demonstrated rather convincingly why it's inappropriate to empirical (and especially inductive) ones. Worse, "proof" tends to especially wildly overestimate certainty when applied to ESMs and paleoclimate (point#=4 in next comment, due to your 4096-character limit on comments). So please don't apply that term in this domain–it makes you sound foolish. 3. You (plural) spent much time bashing the IPCC for underestimating ultimate forcings (particularly temperature and sea level) without mentioning one *crucial* fact, of which you should be aware. (And I should be able to find a cite, but my brief websearch failed.) Since it's so important, I'll bold it: the IPCC does not forecast beyond 100 years from present. (You (Alex) could have done, and hopefully will do in future, a tremendous service to environmental journalism by pointing out this simple but important fact. When any environmental journalist say that "the IPCC forecasts [whatever]," they should always follow that by saying "by [terminal forecast date], with [whatever] likely to increase after that.") You (plural) spent a *lot* of time bashing the IPCC (et al) for excluding the slower feedbacks, and implying that this was ideologically driven. Ideology may contribute, but one must give credence (at least, attention!) to the fact that the folks with the formal credentials in this domain generally agree that only the fast feedbacks apply over the IPCC's *defined* temporal scale. FWIW, I completely agree with you–following Kevin Anderson and other folks with formal credentials in this domain–that 2 °C increase in global mean temperature by 2100 CE is already "baked in," and continuing to discuss it as an achievable policy goal for 2100 CE is probably fradulent (though probably well-intentioned). "Silly and dangerous" (to quote you) STM reasonable predicates for such discourse. That being said, when Wasdell claims that one can forecast the full effects of *all* paleoclimate-attributable feedbacks to occur not by (e.g.) 3000 CE but by 2100 CE, you really should note that this is an extreme minority opinion with not much backing it: see points 2 (above) and 4 (next comment). 4. Wasdell repeatedly valorizes claims from paleoclimate over claims for modeling. I'm a modeler, but humble: I accept (mostly 🙂 your (plural) claims regarding the inadequacies of our current efforts. That being said, it was *totally irresponsible* of him (primarily–you (Alex) secondarily) to *not* point out the *huge* uncertainties attached to paleoclimate evidence, esp WRT temperature and timescale. We don't have paleo-thermometers or -calendars! we have only *proxies*. And guess what: we infer from the proxies to the quantities of interest using … wait for it … models! Hence I *strongly* encourage you to do a show on paleoclimatic evidence in the near future: host a guest with formal credentials in the domain to discuss what we can legitimately forecast from it, and how the uncertainties regarding paleoclimate compare to those of widely-used (e.g., CMIP5-included) models. Net: this show was not a high point for Ecoshock, but (based on past performance) I hope for better in the very near future. "All scientific statements and concepts are open to re-evaluation as new data is acquired and novel technologies emerge. Proof, then, is solely the realm of logic and mathematics (and whiskey). That said, we often hear 'proof' mentioned in a scientific context, and there is a sense in which it denotes "strongly supported by scientific means". Even though one may hear 'proof' used like this, it is a careless and inaccurate handling of the term." While I disagree with Roche – from the scientific context of Alex's statement I read "strongly supported by scientific means" – perhaps Alex could've used the phrase "scientific evidence" instead. Point 2. Wasdell's lack of credentials. It is true Wasdell is not a climate scientist and Alex did not mention this explicitly at the beginning or at the end of the podcast. But he readdresses this at the beginning of the next Eco Shock episode. See point three under http://www.ecoshock.info/2015/11/true-voices.html. This was posted last week. "You (plural) spent a *lot* of time bashing the IPCC (et al) for excluding the slower feedbacks, and implying that this was ideologically driven. Ideology may contribute, but one must give credence (at least, attention!) to the fact that the folks with the formal credentials in this domain generally agree that only the fast feedbacks apply over the IPCC's *defined* temporal scale." "Here we present results from a fully coupled, three-dimensional carbon–climate model, indicating that carbon-cycle feedbacks could significantly accelerate climate change over the twenty-first century." Including the carbon cycle feedback in the sensitivity value puts the proposed IPCC carbon budget in the red as shown by Wasdell's presentation. "It is difficult to assess the speed at which slow feedbacks will become important in the future, because of the absence in paleoclimate history of any positive (warming) forcing rivaling the speed at which the human-caused forcing is growing." "Uncertainty may be Exxon’s friend, but it is not ours. And we therefore know, from uncertainty, with considerable certainty that we need to act on climate change." "Lewandowsky's team combined the shape of the curve showing the probable values of the Earth's climate sensitivity with the shape of climate economic costs curve, and came to an inescapable conclusion: more climate uncertainty means the expected damages from climate change are higher." The graph is found at http://www.skepticalscience.com/pics/RoeBaker.jpg. Notice the shape of the probability distribution. In summary, more calamitous events are more likely than benign events in the future. The probability of warming between 1-1.5°C is extremely close to zero. 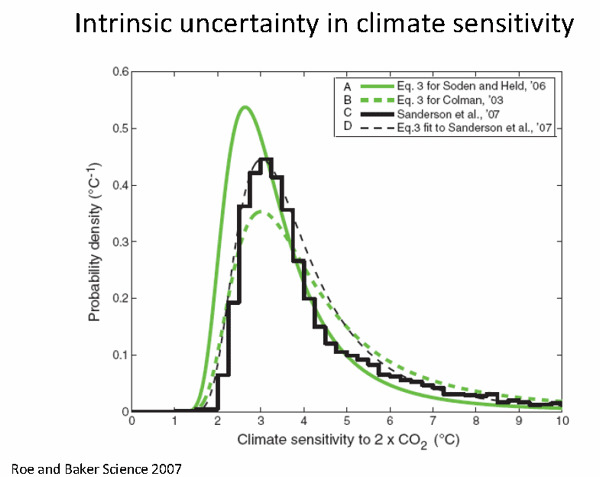 However, the probability of warming of say 6°C, depending on curve, is somewhere between 5-10%. For the sake of comparison the probability for 3°C warming is in the range of about 35-45%. 5-10% is a lot more uncertain than 35-45%. But would you ride a plane with a 5-10% chance of crashing? By the same token, would you do the same for the Earth's future? "Even deep systemic uncertainties, often described as “unknown unknowns”, can—ironically—be a source of knowledge. Wendy Parker and James Risbey have recently shown that although unknown unknowns, by definition, cannot be anticipated in the particular, the likelihood that one or the other surprise may arise can be anticipated. We cannot specify what the unknown unknowns are but it doesn’t follow that it is impossible to recognize the risk that such features exist in climatic-ecological-social systems."